The prominent toothed snout makes this ray easy to identify. Usually 24-28 unpaired teeth on each side of the ‘saw’ (hence the name ‘sawfish’). Maximum length up to 18 feet (5.5 m). They reach sexual maturity at about 10 years of age and may live for up to 20 years. Found most commonly in shallow coastal waters but reported as deep as 400 feet (121 m); juveniles prefer shallow coastal waters including estuaries and adults are most often found in deeper water. Thought to feed on fishes and benthic crustaceans. Aplacental viviparity (fertilized stingray eggs remain in the mother’s uterus, ingesting their yolk sacs. Once they have fully consumed their yolk sacs, the embryo is nourished by “uterine milk”), a lipid and protein-rich fluid, secreted by the mother. Gestation period is unknown. Up to 15 to 20 pups per litter. Protected by the State of Florida and the US federal government under the Endangered Species Act. Non-aggressive species. Sometimes caught on hook and line by fishers that target sharks, tarpon, snook, and red fish. Should be handled with care and released unharmed. 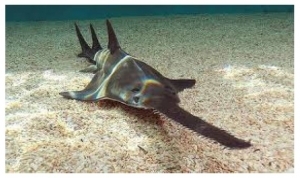 FWC has a program for people to report sawfish sightings (http://myfwc.com/research/saltwater/fish/sawfish/contact/).